Typical attire: sandals and maroon-saffron robe. Typical day: wake at 3:30 a.m., prayer and meditation. Typical message: peace, nonviolence and independence for his spiritual homeland, Tibet. 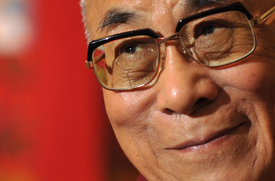 If you guessed the Dalai Lama, you’re right. But did you know he has a lobbyist, too? We never imagined Tibet’s exiled spiritual leader would show up as a client in our new Foreign Lobbyist Influence Tracker. But there he is amid details about the Office of Tibet, which handles his affairs in the U.S. Compared with the 300 or so other foreign agents in the Tracker, the office’s activities are tame. It isn’t hitting on Capitol Hill, handing out campaign cash, or spending millions on K Street p.r. types. But as a foreign entity that advocates for a political cause in the United States – Tibetan independence – the Office of Tibet is considered a foreign agent under federal law. That means it must file the same disclosure forms as lobbyists for such high rollers as the United Arab Emirates, Turkey and Japan. The Tracker is a joint project by ProPublica and the nonprofit Sunlight Foundation, which created this screencast about how to use the Web site. According to the data, the nonprofit Office of Tibet listed 89 lobbying contacts in 2008. The group filed nearly $325,000 in staff, travel and office expenses. It also reported receiving $800,000 in donations, mostly from Tibetan groups around the country. Those numbers hardly make the office a lobbying heavyweight -- but there are some interesting tidbits. Among the listed media interviews and visits with local Tibetan groups is a meeting with longtime Tibet supporter Richard Gere, the actor. One memorial event honored Sir Edmund Hillary, the first person to summit Mount Everest on the Tibet-Nepal border. The details come from forms the Tibet office filed under the Foreign Agents Registration Act, or FARA. For the Tracker project, we gathered one year’s worth of information from these paper reports and made them searchable by country, lobbyist, issue and members of Congress who’ve been lobbied. The Office of Tibet is not new to the lobbying scene. It first registered under FARA in 1964 – five years after the Dalai Lama escaped Chinese occupation and set up an exile government in Dharamsala, India. A resolution passed by the House this year recognized the 50th anniversary of the Dalai Lama's being forced into exile and called for a solution on Tibet’s independence. This year’s Omnibus Appropriations Act would provide up to $7.3 million to non-government groups for cultural preservation in Tibetan communities. More than 15,000 Tibetans live in the United States, according to the Tibet office. Coming Thursday from the Sunlight Foundation: Presidential candidates, members of Congress and the Manhattan district attorney have made the Cayman Islands synonymous with tax evasion. How the Caribbean nation fought back, hiring a high-powered firm to argue that it’s a model of transparency.